Is your business hesitant to jump on the active online bandwagon? Well, we don’t understand why! After all, 70-90% of people go online before buying a product or service, so you SHOULD, without hesitation invest most of your advertising dollars with an internet marketing firm in Omaha Ne. Tick tock. The time is now to outsource all your advertising, PR and Marketing Firm Omaha services to us! Stern PR™. We offer what your business needs to succeed on & offline. 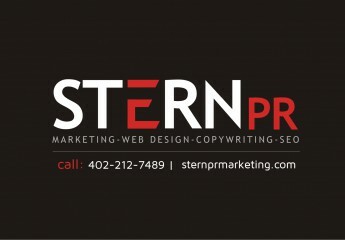 Stern PR Marketing™ is not a mere Omaha website design firm. We are a full service creative agency. We are known for our exceptional website content writing, too. Our photography and video in Omaha Nebraska. We see the big picture offering total corporate branding based on our years of expertise in Advertising, Marketing, Public Relations and Journalism. Few, if any, internet marketing firms in Nebraska can offer all of these services. Copy writer extraordinaire Susan Stern pens a fantastic website, press release and social media – that few can do. Stern PR Marketing™ is a one stop creative shop. Run your company. We will do the rest. We handle everything on your best behalf on and offline. We provide exceptional Website Design in Omaha Ne services, Social Media, Graphics, Copywriting, Omaha SEO and Video. We’re a full-service Advertising, Marketing and Public Relations Firm in Nebraska. So, run your company. Let Stern PR™ Omaha handle the rest. Since 2004, Stern PR Marketing helps business grow!